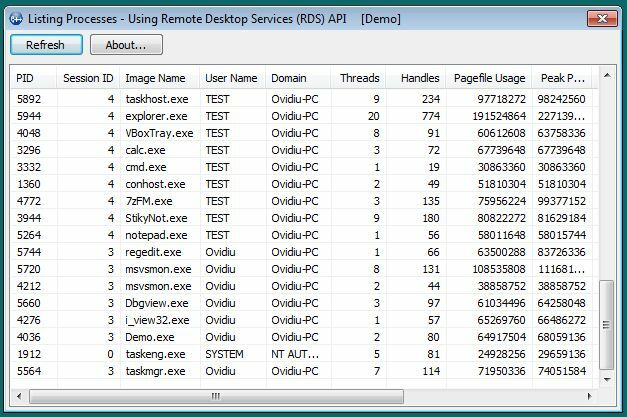 We can call WTSEnumerateProcesses function to get information about the active processes on a specified Remote Desktop Session Host server. However, if pass WTS_CURRENT_SERVER_HANDLE in first argument (server handle), we can enumerate and get info about processes which are running on local machine. The following example calls WTSEnumerateProcesses function, then fills an array of WTS_PROCESS_INFO structures. If the target OS is Windows Vista or newer, we can alternatively use WTSEnumerateProcessesEx which can get additional info in WTS_PROCESS_INFO_EX structures. the time, in milliseconds, the process has been running in kernel mode. Now, let’s fill a listview control with the processes info grabbed by RDSAPI_EnumProcessesEx. More implementation details can be found in the attached demo project. WTS prefix comes from Windows Terminal Services which is the former name of Remote Desktop Services. The demo project is a simple MFC dialog-based application that uses the above functions. This entry was posted in MFC, Windows API and tagged listview, mfc, Processes, Windows API on 2013.12.01 by Ovidiu Cucu. The previous article demonstrates how to improve performance by using a virtual listview control (having LVS_OWNERDATA style set) and handling LVN_GETDISPINFO notification. That’s pretty cool! However, it still can be improved by caching input data. That means, instead of first loading the whole input data, we can load only how much is necessary at a time. For that purpose, before sending LVN_GETDISPINFO, a virtual list control sends LVN_ODCACHEHINT, giving a “hint” of what range of items should be loaded. 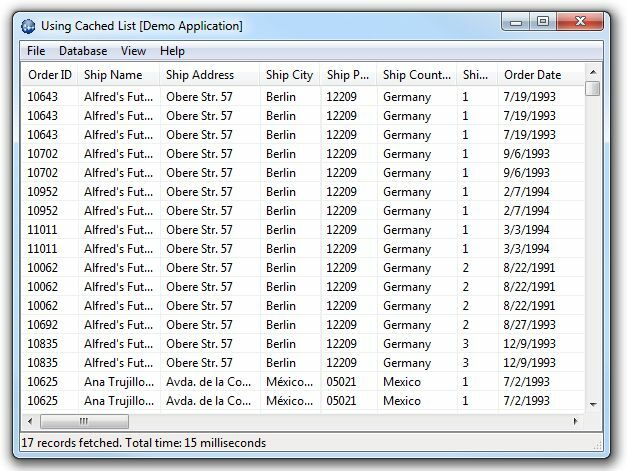 An application can verify if these items are already loaded into cache. If not, then can load them. Let’s see a simple example! Set the virtual list items count with CListCtrl::SetItemCountEx. Handle LVN_GETDISPINFO notification like in the previous example. Finally, handle LVN_ODCACHEHINT for loading cached data. // used to update the cached item for use with a virtual list view. if(dwToRow >= dwFetchedRows) // new rows must be fetched, so let's do it! The caching mode presented here is as simple as posible. It presume the total number of items known. Also it adds data in cache each time is needed without care about memory. If necessary, that can be improved for handling an unspecified number of items and/or for keeping a maximum number of items in cache. That would be necessary if dealing with very large amounts of data. See also the previous article notes. The demo project uses the same database and performs the same query like the one presented in the previous article. Please, feel free to download and compare. This entry was posted in MFC and tagged listview, mfc on 2013.11.24 by Ovidiu Cucu. Inserting a large number of items in a listview control, may take a lot of time. A virtual list does not internally keep items information (like text and so on). Instead, it notifies its parent, asking info only for the items/subitems which are currently displayed. That makes it a good choyce if dealing with a large number of items. First note this style cannot be set after control creation. For a listview control contained in a dialog resource, it can be done by setting True for Owner Data property. For a listview control kept by a CListView class, the right place is in the overridden PreCreateWindow. May be, for example, an array of database records as a result of an SQL query. See the attached demo project for a concrete example. Set the virtual list items count. Finally, handle the LVN_GETDISPINFO notification. As said in the beginning, a virtual list doesn’t internally keep items info. Instead, it sends LVN_GETDISPINFO notification via WM_NOTIFY message, each time it needs info about the items to be actually displayed. For a listview control we can use the wizard to map LVN_GETDISPINFO in the parent dialog class or the reflected =LVN_GETDISPINFO notification, in a class derived from CListCtrl. In a class derived from CListView we can also use the wizard to map reflected =LVN_GETDISPINFO notification. First argument is a pointer to a NMLVDISPINFO structure. From its member of type LVITEM, we can get which info is required (text, image, etc) and the index of item and subitem that is being displayed. Next, we have to fill that structure with the information from an external data collection. // Use pItem->iItem, pItem->iSubItem, pItem->pszText, and pItem->cchTextMax. 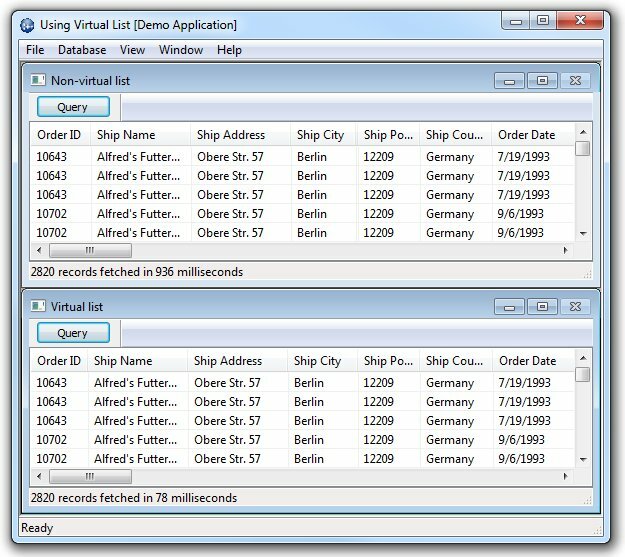 The demo project uses the same SQL query to fill a non-virtual and a virtual listview. As can be seen in the screenshot, the virtual list worked over ten times faster. A future article will show how to improve the virtual listview control in order to deal with much larger amount of data, by caching. This entry was posted in MFC and tagged listview, mfc on 2013.11.04 by Ovidiu Cucu. 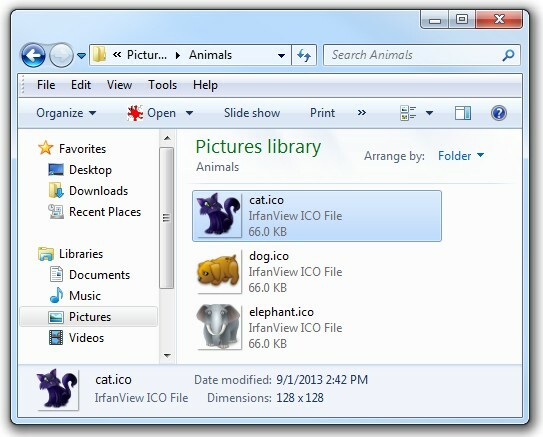 Using Windows Explorer we can notice, aside others, the Tile View mode. It looks like icon views but, beside a title (that shows the file name), it displays some additional info (file type and size). This articles describe how to set Tiles View in our own listview (SysListView32) Windows control. Let’s say, we’ve placed a list control in a dialog template. Possible, the first attempt is to search for a “Tile” value of the “View” property. No luck: we can see only “Icon”, “Small icon”, “List”, and “Report” (LVS_ICON, LVS_SMALLICON, LVS_LIST, and LVS_REPORT types). However, there is a solution: send LVM_SETVIEW message or use ListView_SetView macro or (if using MFC) call CListCtrl::SetView. In the same way, we can switch to the other view types, by passing LV_VIEW_ICON, LV_VIEW_SMALLICON, LV_VIEW_LIST, or LV_VIEW_DETAILS. That’s pretty easy. However there are a little bit more things to do. For this purpose we can send LVM_SETTILEVIEWINFO message or use ListView_SetTileViewInfo or call CListCtrl::SetTileViewInfo. // Set the maximum number of text lines in each item label, not including the title. This can be done when the item is inserted or later, by sending LVM_SETTILEINFO, using ListView_SetTileInfo or calling CListCtrl::SetTileInfo. // Displays columns 1, 3 and 5 for the item 2. This is just a brief presentation. You can find more hints and details in the links below and in the demo project attached here. This entry was posted in MFC, Windows API and tagged listview, mfc on 2013.10.05 by Ovidiu Cucu. 1. Optimize the database, index fields if necessary. 2. Choose the right database access technology. Well, let’s say we are just “poor developers” and both database designer and project manager are idiots. Then, there’s no choice and we have to live with them without resolving #1 and #2. In most cases, UI is blocked as a result of populating a list control with a large number of rows, from a recordset. Have we to make this in a separate thread? Not really, wait a minute! 3. Use a virtual list. A virtual list does not keep the UI busy until it’s filled with thousands, tens of thousands or even hundreds of thousands items. It just asks info about items which have to be currently displayed. 4. Not enough? We have to deal with queries which return millions, tens of millions or even more results? No problem, can use a cache mechanism. 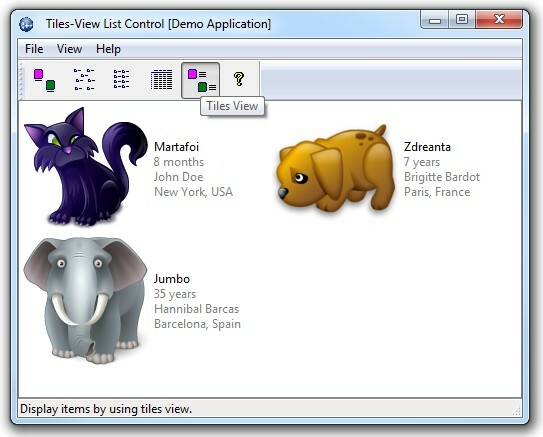 Both #3 and #4 are supported in the Windows common listview (SysListView32) control. This entry was posted in MFC, Uncategorized and tagged listview, mfc on 2013.02.06 by Ovidiu Cucu.